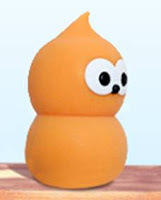 EDF, one imagines, is going to have its work cut out under le nouveau régime. Firstly, it must dissuade President Hollande from pursuing his phase-out policy for nuclear generation. Secondly, it will doubtless face a reversion to type whereby French governments of yore would 'solve' unemployment by ringing up EDF, France Telecom et al with instructions for them to hire an additional 24,000 people or so at a time. Good luck with all that. And then there will be the vexed issue of EDF investing in 4 or more nukes in the UK. Let's not go here just yet - they are certainly in no hurry - but rather enjoy their latest UK advertising which as you may have noticed features, errr, well ... a small orange Richard. Which is promoting "electricity from low carbon generation". Presumably this has tested better in focus groups than mention of dodgy old nukes. But there you go - who can afford to fly in the face of public opinion ? Eh, M. Sarkozy ? I wonder if it'll be England's lights or those in France that go out first? With the mad policies of Huhne on top of NuLabour's 10 years of dither on energy security, it'll be a close run thing! Richard's hair can sweep both to the left, and to the right, which must be handy. Today, on the business pages it goes to the right, and on the home page to the left! Can't stop laughing at the choice of mascot. A self-glowing plutonium turd it must be! How gloriously apposite! Ah well, perhaps the Coalition might need to nationalise the power supply industry fast to protect the UK from disaster. I recall that there was supposed to be link from the French nukes to the UK at one time to boost our supplies in times of need. The future's shite. The future's orange. Demetrius, Anon @ 8:06 - indeed there is: and (since French riverside nukes don't work in hot weather) we supply them when they can't supply themselves, too ! PS, on the topic of orange, I recall a popular and distinctly non-eco washing powder, name of Radion with packaging far from green; it was bright orange ! in as few moves as possible!